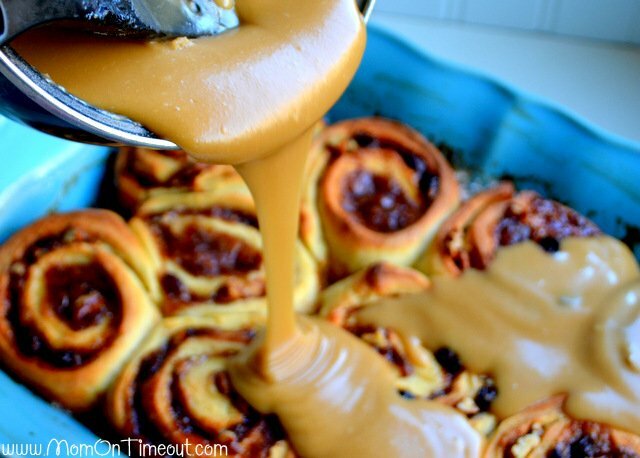 These outrageous Caramel Pecan Cinnamon Rolls can be prepared the night before and baked fresh in the morning! 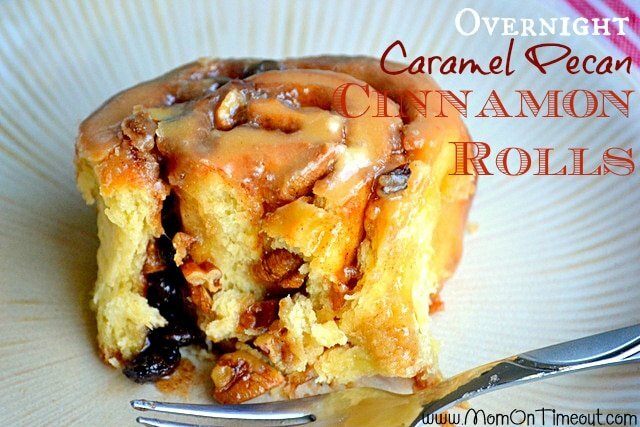 Dripping with delicious caramel cinnamon roll icing and stuffed with pecans and raisins – these cinnamon rolls are irresistible! Make sure to try these S’mores Cinnamon Rolls with Marshmallow Frosting or Caramel Apple Cinnamon Rolls for an extra special treat! Basically, I FULLY appreciate any breakfast that can be made in advance. Whether it’s my Freezer Breakfast Burritos or Make-Ahead Honey Vanilla Parfaits – time savers in the morning are essential in my household. These easy overnight cinnamon rolls help me out…A LOT. I make them the night before. Let them get their second rise in while I’m watching TV with the hubs and then throw them in the fridge before I go to bed. First one up takes them out of the fridge and sets them in a warm area to let them come to room temperature before baking. If your oven has a proof setting – that is perfect! Cinnamon rolls can seem extremely difficult and challenging, especially if you’ve never made them be. I’m here to dispel the myth that cinnamon rolls are HARD. Anyone can make cinnamon rolls, I promise. 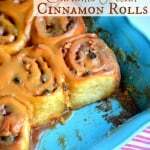 Cinnamons rolls start with a dough that is slightly sweet and usually made with yeast. The dough rises until doubled in size before rolling out into a rectangle. The filling is usually a combination of butter, sugar and cinnamon. Brown sugar or granulated sugar can be used. The filling is spread onto the dough and rolled up into a log. The log is cut into slices using a very sharp knife or unwaxed dental floss. The cinnamon rolls rise again before baking. Warm cinnamon rolls are frosted and enjoyed. I briefly mentioned the filling above and while that filing is delicious, for this recipe, we’re going all out. I included both brown sugar and granulated sugar in my filling as well as cinnamon, pecans, raisins, and of course butter. The butter is what helps the filling “stick” to the dough and is super important. Don’t skimp! When the rolls are in the oven it’s time to get started on the caramel icing. The caramel icing is made with brown sugar, butter, heavy cream, vanilla extract and a little powdered sugar to thicken it up. Basically, calorie free. The cinnamon roll icing takes only a few minutes to whip up and it is seriously yummy! I sampled it several times before pouring over the rolls so trust me, I know what I’m talking about here 😉 Once the rolls are done, pour the caramel icing over the hot rolls and keep pouring until you have just a small amount remaining in the pan – this is for those who like “extra” on the side OR for the cook who is now cleaning the kitchen. Now it’s going to look like a ridiculous amount of icing – and it is – but here’s a time lapse after pouring it on – you can see how it slips into all the cracks and crevices on the cinnamon rolls. Check and then double check your yeast. It needs to be fresh and active or your rolls will not rise. Allow yourself some time beforehand to read through the instructions. This is always helpful when trying out a new recipe. Use a stand mixer if you have one. It makes mixing and kneading so, so easy. Don’t add in too much flour. You may be tempted to keep adding in flour – don’t. The dough should be slightly sticky, slightly tacky. When you roll it out into a rectangle, even more flour will be incorporated into the dough so you really want to err on the side of not enough instead of too much. You can always work more flour into the dough later if needed. I use a stand mixer. I have pretty bad carpal tunnel and I just can’t knead the dough properly with my hands like I used to. The dough hook is a lifesaver for me. You’re going to need a 9 x 13 baking dish or two smaller dishes to bake the cinnamon rolls in. A pastry mat or large cutting board to roll out the dough. A pastry cutter or sharp knife or unwaxed dental floss to get nice clean slices. 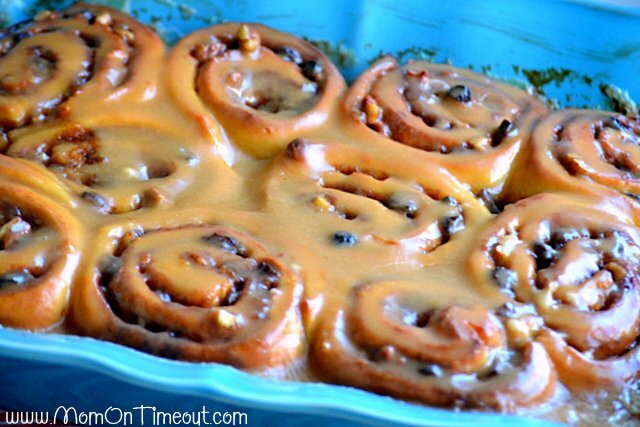 These outrageous Caramel Pecan Cinnamon Rolls can be prepared the night before and baked fresh in the morning! 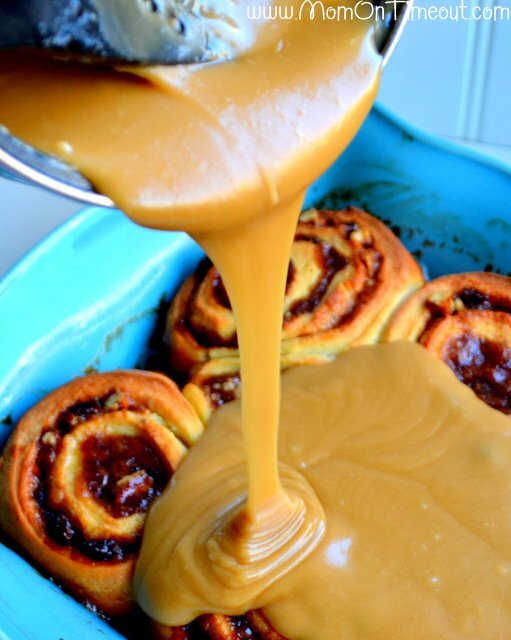 Dripping with delicious caramel icing and stuffed with pecans – these cinnamon rolls are irresistible! Mix together 2 tsp sugar, warm milk, and yeast in a mixer bowl. Let stand for five minutes. Beat eggs, sugar, and salt until well combined. Add egg mixture to yeast mixture and whisk to combine. Add 1 cup of flour and continue mixing until smooth. Pour in the melted butter and mix well. Continue adding the remaining 3½ cups of flour, ½ cup at a time until dough is stiff but still slightly tacky. Move the dough to a greased bowl and cover with a towel or plastic wrap. Place in a warm area and let rise until doubled in size. Approximately 1 hour. Meanwhile, combine the sugar and cinnamon for the filling. Chop the pecans and melt the butter. Once dough has risen, lightly flour a large cutting board. Punch down down and roll out to approximately 12 x 16 inches. Spread on the melted butter and sprinkle the sugar and cinnamon mixture. Next sprinkle on the pecans and raisins. Starting on a long side, roll up the dough up into a cylinder and pinch the edge to close. Cut the cylinder in half and then cut each half into five rolls for a total of ten rolls. Remove from refrigerator and let rolls come to room temperature in a warm area. Preheat oven to 375 degrees. Bake rolls for 20-25 minutes until golden brown in color. Melt butter in a saucepan over low heat. Add the brown sugar and salt and stir until combined. Continue cooking over low heat for another 5 minutes or until sugar is dissolved, stirring constantly. Add the heavy whipping cream and stir to combine. Whisk in the powdered sugar until nice and smooth. Remove rolls from oven and pour on icing immediately. Let cool slightly and serve. Originally published January 18, 2013. « Clarified Butter – Easier than you might think! Yum yum yum. 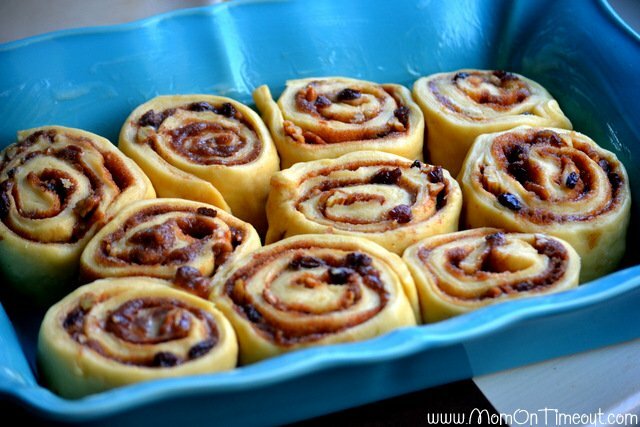 Gonna make these awesome looking cinnamon rolls this weekend. But, my wife does not like pecans. Do you think they will still be good without the pecans? 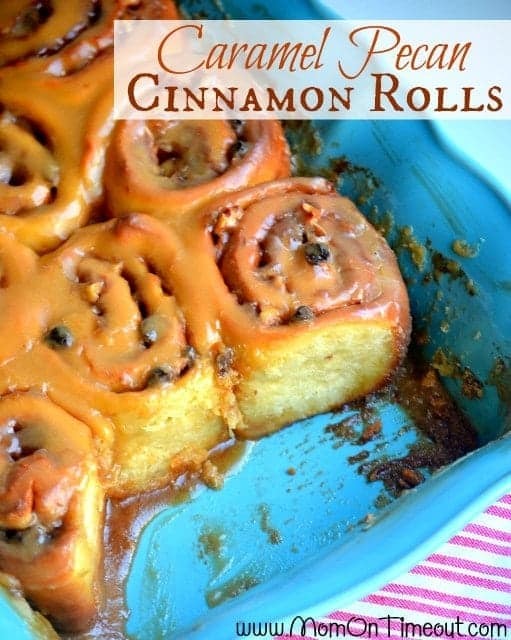 This cinnamon roll looks amazing and I can’t wait to make them! I don’t know what Ap flour is. Could you please tell me. Thanks! Hey! I’m making these tonight cause I’m bringing them to church in the morning. With the glaze, can i make it tonight and reheat it or would that not work the same? Just what the mixer is doing to work in the flour Diane. Thanks!